Falkirk folk are made of tough stuff as new exhibition proves! Expansion of Falkirk...and Steeple Bell was courtesy of Earl of Callendar. The History of Falkirk in 10½ Objects will open in the Second Floor Gallery at Callendar House on Saturday (January 26) and will run until May 4. Based on a talk I have given to many local societies over the last five years, it tells the 3500 year history of Falkirk and its area in just 10 and a half objects. Carronade...marked the start of two centuries of ironfounding in the Falkirk district, which employed a huge proportion of the local population. Last week, we studied the Falkirk Tartan, Carriden Cross, Stenhousemuir Pottery and the Cross Well. The eighth object is the Steeple bell. Up until the mid 17th century Falkirk was just a small town with an important parish church. Cartoon strip...was used in newspapers to advertise our other national drink. It was part of a very successful advertising campaign for Irn Bru. 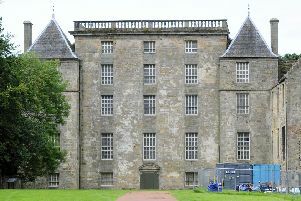 Its patrons were the powerful Earls of Callendar, who played an important role in the nation’s politics. This resulted in enhanced status for the burgh and the privilege of holding markets and having trade guilds. Partly as a consequence of this, the High Street was re-aligned and extended at its east end, allowing the town to expand. A new triangular-shaped market place was created and in 1697 a tollbooth was erected at one end. Transmitter apparatus...was presented to Hart Radio by John Logie Baird and is now part of the museum's collection. This was where the tolls were levied on market stalls. A careful eye was kept on those trading in its shadow to ensure the quality of goods and maintain its reputation. A new bell was cast in Edinburgh by John Meikle for the steeple in 1697, paid for by the Earl of Callendar and gifted to Falkirk. Its purpose was to broadcast the time of day to the population by chiming on the hour. This not only regulated trading hours but daily life at a time when there were very few timepieces. The bell rang on special occasions too, such as the proclamation of a new monarch, and could also be used to raise an alarm. During World War Two, the bell remained silent so it could be used to warn of invasion by the Germans – the only exception being when news was received of the victory at El Alamein. The bell was also rung as a death knell for local people and on Sundays to call the townsfolk to prayer. This venerable bell is 55 years older than the Liberty Bell in the USA. The ninth of our 10.5 objects is the carronade. There are few places in Britain that have put a place name into an English dictionary for reasons other than regional food. But Carron appears twice; once for Carron Oil – at one time used to treat burns – and once for a type of cannon known as a carronade. This is a play on the word cannonade, though originally it was known as a Gascoignade after Charles Gascoigne, the manager of the Carron Company. Just as we refer to china as a type of pottery, so too carronade uses lowercase c.
A carronade was a short range cannon with a large bore and high muzzle velocity – a cross between a howitzer and a long cannon. The idea was conceived by General Robert Melville in the 1770s but it was Carron Company that developed it, putting it at the forefront of the arms race. Carron Company quickly realised that the grade of iron used for cannon was essential to their quality and blended ores to get the right grade of grey iron. The barrel was cast solid and the bore was then drilled out – something that very few foundries were doing. This method meant that there were fewer gas cavities lining the bore, hence fewer points of weakness. The carronade weighed roughly a third of the equivalent cannon meaning ships could carry greater numbers or more cargo. Because it was shorter than a conventional gun, and all cannon were muzzle loaded, it could be fired more rapidly too. So as enemy ships moved in to capture British ships for prize money the carronade proved devastating. It also marked the beginning of two centuries of ironfounding in the Falkirk district, an industry that employed a large proportion of the population. The 9½th of our 10.5 objects is Irn Bru, the recipe for which was composed in Falkirk by Robert Barr in the late 19th century. Adverts first appear in 1900 and its fame spread quickly when Robert’s son, Andrew, established a factory in Parkhead. Several other companies made Iron Brew but in 1946 Barr’s changed the spelling to Irn Bru and it became a marketing success. The secret to Irn Bru’s success lay in the ingredients and marketing. For more than a century only the head of the Barr family knew the entire recipe – or so it is said. From early on the company promoted it as a health drink and associated it with strength and vigour. In the 1950s a cartoon character, known as Ba-Bru, was created and appeared in comic strips in newspapers. But perhaps the best remembered slogan is “Made in Scotland from girders.” Irn Bru also became known as “Your other national drink” – presumably the other one was whisky. The final of our 10.5 objects is the Baird televisor. In the first decades of the 20th century there were numerous inventors, men of vision, working on the idea that it might be possible to transmit moving images using radio waves. In Falkirk a group of radio enthusiasts experimented with the idea, prominent amongst who was John Hart, the owner of a radio shop. The genius among them, however, was not a local man but a visitor whose relatives lived in Sunnybrae, Camelon. From Helensburgh, his name was John Logie Baird. He demonstrated his latest machine in the Temperance Café in Falkirk’s Lint Riggs in 1925. He had intended to transmit the image of a dummy head from one room to another but the distrustful residents pointed out he might already have the image stored in the device. So he took a young boy, John Shaw, from the audience and captured and transmited his image. According to the official record, Baird demonstrated the first working television system on January 26, 1926, so the Falkirk date is significant. In later years John Shaw wanted the event marked with a plaque at Lint Riggs. But the wooden plaque which was then cast in iron, was never erected and is now in the museum. Baird acknowledged his association with Falkirk by presenting his early transmitter apparatus to Hart Radio Supplies on September 5, 1926. Displayed in the High Street shop window, it too eventually made its way to the museum in Dollar Park. It is our final object, for the moment at least...Falkirk’s story continues. You can explore more of the museum’s collection online at collections.falkirk.gov.uk.